Spectroscopy is a powerful tool. In the late nineteenth and early twentieth century, astronomers around the world compiled larger and larger sets of stellar spectra. Most were taken with photographic plates, and left in their original, negative form (in which dark regions indicate high intensity of light, and white regions indicate very little light). Henry Draper, a wealthy amateur astronomer, left a very generous bequest to the Harvard College Observatory. The directors of the Observatory used this money to fund a large-scale project: the collection and measurement of thousands and thousands of stellar spectra. 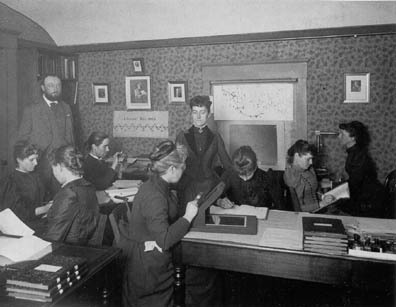 The resulting Henry Draper Catalog of Stellar Spectra remains one of the most important sources of information on stars, a century after its creation. For example, the first extrasolar planet detected by the transit method circles the star HD 209458, which is number 209,458 in the Henry Draper Catalog. Thanks to a generous donation from the estate of Henry Draper, the Harvard College Observatory acquired the world's largest collection of stellar spectra in the late nineteenth and early twentieth century. Few male scientists would pore over the thousands of tiny spectra with microscopes on hundreds of glass plates; it was too boring and didn't pay enough. The job of recording, measuring, and classifying this wealth of information was given to a group of female scientists, led by Williamina Fleming. Cannon noticed that this arrangement ALMOST put stars in order by temperature -- which she knew independently from the overall shape of the spectrum and from photometric colors. With just a few changes (getting rid of some intermediate classes, and shifting the O class to the top of the list), Cannon created a true temperature sequence that has since been used as the primary means of classifying stars. The result of decades of hard work by the Harvard astronomers was the Henry Draper Catalogue and Extension , which contains classifications for over 270,000 stars. Maury put the stars with wide, strong lines into groups she called "classes a and b," and the stars with narrower, weakers lines into "classes c and ac." Early versions of the HD catalog included these notations. It was no easy task to place a star into the HR diagram: while the horizontal position was easy -- just measure the difference in B and V magnitudes -- the vertical position required that one know the DISTANCE to a star in order to convert the apparent magnitude into absolute magnitude. Distances were and still are hard to measure accurately. Distinguishing giants from dwarfs took a lot of effort. But Hertzsprung found, to his pleasant surprise, that Maury's spectral groups correlated very well with position in the HR diagram. Stars with weak, narrow lines -- Maury's "c and ac" stars -- were giants, while stars with strong, broad lines were dwarfs. This was great news! Taking the spectrum of a star was a bit more effort than measuring its magnitude, but much easier than determining its distance. Moreover, the Harvard College Observatory had already acquired and classified thousands of stars. Hertzsprung and other astronomers could now pick out giants or dwarfs simply on the basis of their spectral class. Over the course of several decades, the astronomers at Harvard made small modifications to their classification system. They removed Maury's groups from their catalogs, so you will no longer see classes which include lower-case "a" or "b" or "c". However, a later system called the MK classification system ("MK" are the initials of Morgan and Keenen, two of the three authors of the system) brought Maury's work back into play. The MK system adopted the main spectral classes from Harvard: stars are given a class -- OBAFGKM -- and a number to designate their sub-class: O5, B3, K2, etc. The Sun's full classification, for example, is G2V. 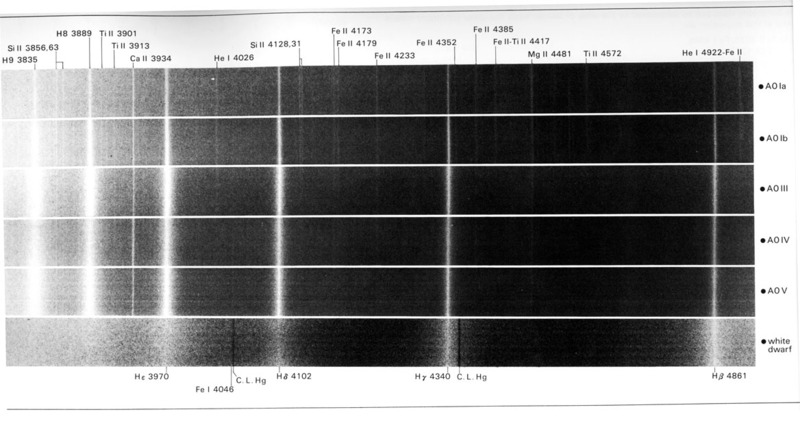 An Atlas of Stellar Spectra describes a later extension of the Harvard system. It provides details on how one should examine low-dispersion stellar spectra to classify them. STELIB provides examples of stellar spectra in digital form. The CLEA project provides software which gives you practice in classifying spectra, plus a tool you can use on real spectra in the future. The Australia Telescope Outreach and Education page on Spectral Classification has links to many good resources.